This cap is worked in the round on double-pointed needles. It can be made in different sizes by varying the yarn and needle size, or the number of cable repeats. 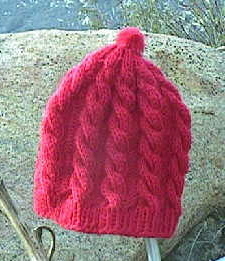 The red cap is shown in a sport weight yarn, and with ten cables fits a small child (head about 16") in worsted weight it will fit a larger child (18"). For an adult-sized head (20-22") you'll need to use 12 repeats or a bulkier yarn. Instructions are given for both sizes. Note: "ssk" means slip, slip, knit. That is, slip 2 stitches as if to knit, place left needle tip through these two stitches and knit them together. It is equivalent to sl 1, k1, psso, but easier to work. Also note: the photo of the red cap is from an earlier version of the pattern. These instructions give decreases as shown in the turquoise/navy cap. 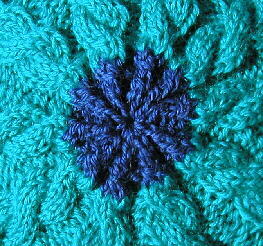 Cast on 80 stitches (100 sts for larger size) and join into a circle, being careful not to twist stitches. Work in K1P1 rib for one inch. Still working the ribbing pattern, in the next round increase by 20 stitches (to 100 for small size and 120 for larger size) by adding a backward loop after every 4th or 5th stitch. Rnds 1-4: (p2, k6, p2) around. Rnd 5 (Cable left): (p2, hold 3 stitches on cable needle to the front of the work, k3, k the three sts from the cable needle, p2) around. Rnd 6: work like rnd 1. Repeat these 6 rounds until the cap has a total length of 5 to 7 inches, depending on size desired, and continue in pattern through the next Rnd 1. On what would be round 2, work a decrease each side of each cable, thus: (p1, k2tog, k4, ssk, p1) around. Work two rounds of: (p1,k6, p1) around. Next round, decrease 2 sts within each cable: (p1, hold 3 sts to front, k1, k2tog; on the held stitches, ssk; k1, p1) around. Knit 3 rnds of: (p1, k4, p1) around. Decrease round: (p1, hold 2 sts to front, k2 tog; on the held sts, ssk; p1) around. Work one rnd: (p1, k2, p1) around. As you work, adjust so that all of each knit rib and purl rib are on the same needle, as you'll be knitting them together on the next round. P the first stitch of the round onto the last needle. Decrease rnd: (ssk, p2tog) ten times. Last rnd: (k1, p1) around, break off yarn and pull through the remaining stitches (20 or 24), drawing tight. Sew a pompom or other ornament at the top. Copyright statement: This is an original design by Judy Gibson, 2003. Permission is granted to print and use this pattern for personal noncommercial use, provided this notice is included. No commercial use or publication of this design--in hard copy or electronic form--are permitted without explicit consent from the designer. Contact: jgibson@cts.com.